I am SOOO excited to show you my latest painting. Sadly, I do not know how to take a picture of a canvas very well and it is a bit shiney. Lisa, you might have to give me a lesson next time I see you! I love it! I think I captured him very well, and I am not meaning to sound boastful, but I haven't painted in so long that this was quite an accomplishment for me! Also, I would like to highly recommend the camera that my sweet husband bought me for my birthday. 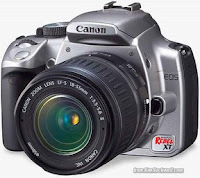 It is a Canon Rebel XT, and it is pretty awesome. I do not know how to fully use it yet, but it has taken some AWESOME photos for me. It is quick and easy to use, and the quality of the photos is awesome.